This section is from the book "Early English Furniture & Woodwork", by Herbert Cescinsky, Ernest. R. Gribble. Also available from Amazon: Early English Furniture & Woodwork. The practice of lathe-turning columns or balusters is of ancient origin, in England, as we have seen in earlier chapters. It has also been pointed out that turning was little used in Gothic woodwork, in its prime, and that the square, or diamond-sectioned and moulded baluster or mullion was employed, in preference, in chancel and other screens. It is revived, as a novelty, during the reign of Henry VIII and in the seventeenth century becomes the usual method of fashioning legs of chairs and tables or the baluster of cupboards. It is also used, with considerable effect, in the decoration of flat pilasters, in the fashion known as the "split-baluster," or the boss, generically termed "strap-and-jewel" work. It was inevitable that the lathe, once used as a general thing, would be improved upon and that new methods, such as the slide-rest for spiral turning, would be devised. In the chairs of the later seventeenth century, turning plays a very important part,. as it is the fashions of the legs rather than of the carving which indicate a definite period,. often within a margin as narrow as a single decade. The slide-rest itself is an ingenious but very simple tool which may be described here for the benefit of the uninitiated. If a plain turned baluster (an ordinary desk ruler may serve) be centred in a lathe and allowed to revolve, a lead pencil held rigidly in the one position will make a ring round the ruler as it turns. If, however, the pencil be moved laterally, say, from left to right, the line which it makes will spiral round the ruler from one end to the other. Moved slowly, the spiralling will be very close, but it will expand the faster the pencil be moved.. Let us replace the pencil, which merely marks, by a gouge or chisel which cuts, and a twist will be produced, more or less regular, according to the even character of the lateral movement. Substitute for the chisel held with the free hand a cutting tool in a slide-rest, the lateral travel of which can be accurately proportioned to the chuck-revolution of the lathe, and it will be seen that every variety of twisting, either in long or short spirals, can be produced with ease and certainty. That twist-turning on the lathe does not appear as a fully-developed art we have seen in a previous chapter. Numbers of chairs and small tables were made, even as late as the first years of the Restoration, with bobbin-turned legs, and these must be regarded as the prototypes of the later lathe-twist. Figs. 296 and 297, from Lyme Park, may be cited here as typical examples of this bobbin turning. Both stool and chair are in beech, stained black, and while the former has been made with a caned-seat to hold a squab cushion, the latter has been expressly devised for fixed upholstery. Both may be regarded as the last phase of the Cromwellian manner. The true Restoration chair, which is nearly always in walnut, is characteristic and unmistakable. Figs. 298 and 299 illustrate the features of this style, which persists from 1600 to about 1680-5, as a fashion, although copies were made at a later date. It is rare, however, in the case of the latter, to find the Restoration details without any intrusion of later features, which will be described at a subsequent stage. Although the details of the pure Restoration chair can be studied in these two illustrations, it may be as well to point them out, and to emphasise them here, in order that any innovations can be easily remarked in later examples after about 1680. These two chairs have framed backs, with the cresting fixed between the squares of the outer balusters, instead of being dowelled on them in the later manner. The back forms one complete frame with carved styles and rails, sometimes pierced through, as in Fig. 298, more rarely cut in the solid, as in Fig. 299. Perhaps because of the general satisfaction at the revival of the monarchy in England, a favourite motif in these chairs is the royal crown, flanked by amorini. This may be remarked in the cresting of Fig. 298, but it is not rare to find the crown introduced in the upright styles of the back framing, and the stretcher uniting the front legs. So general was the use of this device, that Fig. 299 is rare from the absence of its use anywhere on the chair. The legs, both at front and back, are spiral-turned, with squares carved, on the fronts only, with paterae. The arms have a long graceful sweep, scrolling over at their ends. The stretcher railing uniting all four legs is of the H pattern, all double twist-turned, and Fig. 299 has an additional rail between the back legs below the seat framing. 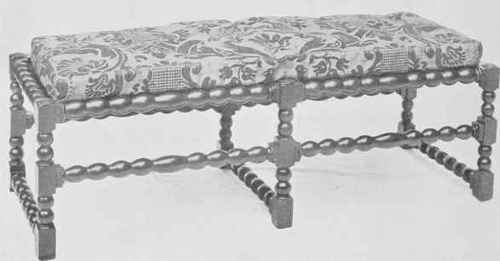 The filling of the back and seat panels of these chairs is always a meshing of fine split cane; any upholstery, as in the two examples here, is nearly, if not always, of subsequent date. C. 1660. Capt. The Hon. Richard Legh. 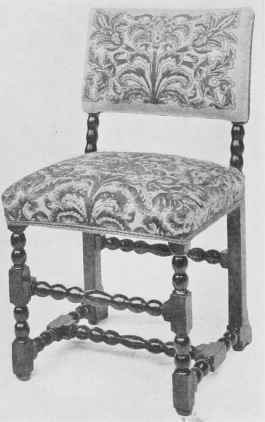 Although apparently confined within narrow limits, this Restoration style of walnut chair, permitted of considerable variety, in details, although not in general appearance. There is, at the same time, a wide diversity in quality, from the extremely rich and finely carved to the positively crude. It is usual, but by no means a justifiable procedure, to dub all these crude chairs as provincial in make, but it is curious to note that where an actual maker can be singled out, either by a label on the chair itself (rare but not unknown) or by the means of an inventory or account, it is the village maker who is often responsible for the richest and best executed specimens. One of these crude (one might almost say cheap) Restoration chairs is shown in Fig. 300, showing, however, the original state of the seat and back panels and the use of the crown on the back cresting and the front stretcher. The projection of the front legs above the framing of the seat was a device to hold a flat squab cushion in position.